Everyone knows who Jeffrey Dahmer and John Wayne Gacy are. The cannibal and the portly killer clown. Well who would have thought someone would think to make a movie about them as rivals? Actually there is much more to the story than that (which I will get into in a second) but that's the gist of it. Interesting concept at least. Released by Walking Shadows and Virgil Films & Entertainment, this wacky horror film stars and was directed by Ford Austin, a character actor who has been in the business for many years. Dahmer vs. Gacy begins with a top secret government operation whose purpose is to create a super killer. To do this, they have gathered DNA from some of the most deadly serial killers in history and cloned them. Of course with every top secret government operation, something goes wrong and two of the clones escape - Jeffrey Dahmer (Ford Austin) and John Wayne Gacy (Randal Malone). Enter Ringo (Ford Austin again), a drunk hillbilly who hears the voice of God (Harland Williams) in his head, telling him he must kill the deadly clones. Meanwhile, the Dahmer and Gacy clones begin a killing spree which turns into a competition. 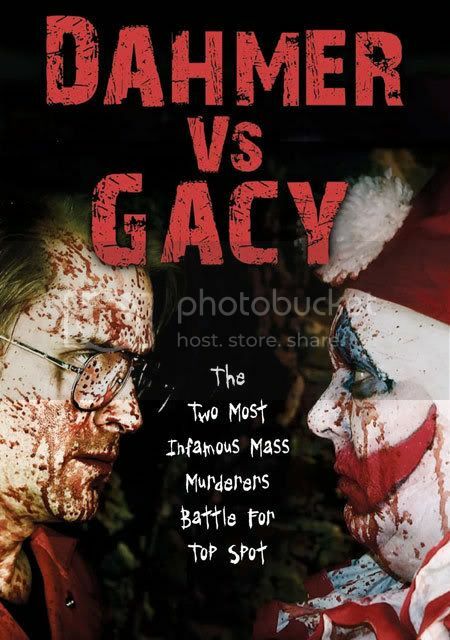 Dahmer vs. Gacy was a silly, bloody, offensive low budget film which was actually pretty good. I'll admit some of the scenes (especially the gay overtones) went a little overboard, but judging by the over the top nature of the film, I'm sure that was the point. Every aspect of Dahmer vs. Gacy went for the balls, from the gallons of blood to the endless use of the F word. With such a silly premise, any other approach probably would have failed so I would say the film makers succeeded. I would say most horror fans will get a kick out of this little oddity, especially those who don't mind crude, bloody humor and off the wall antics. Oh yeah, there are some ninjas thrown in for good measure too! Can't go wrong with ninjas.